Hi-Tech delivers Computational Fluid Dynamics (CFD) services to simulate fluid flow within the separators as well as track the movement of gas/liquid and liquid/liquid interfaces, gas bubbles, oil droplets and solid particles using advanced multiphase models. 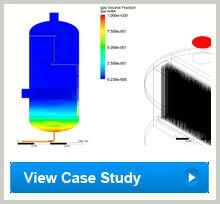 Our solutions allow designers to enhance separator vessel performance without the need for extensive physical testing. Flow distribution is a critical factor in all of the separation processes, whether gas/liquid, liquid/liquid or gas/liquid/liquid or gas/gas/liquid. As such, our CFD solutions are aimed to study the influence of separator inlets, internal and outlets along with sloshing in separator vessels mounted on floating platforms and its effects on separation. Our team of expert CFD analysts solves issues pertaining to oil field problems in separators and aid in the development of new products, optimization of vessel design, understanding the underperformance of existing separators, evaluating performance improvements by installing retrofits or internals such as vane packs, surge rings, weir plates and baffles.